In the Designer View, we drag a ListPicker component from the Palette and then set the properties for the ListPicker. 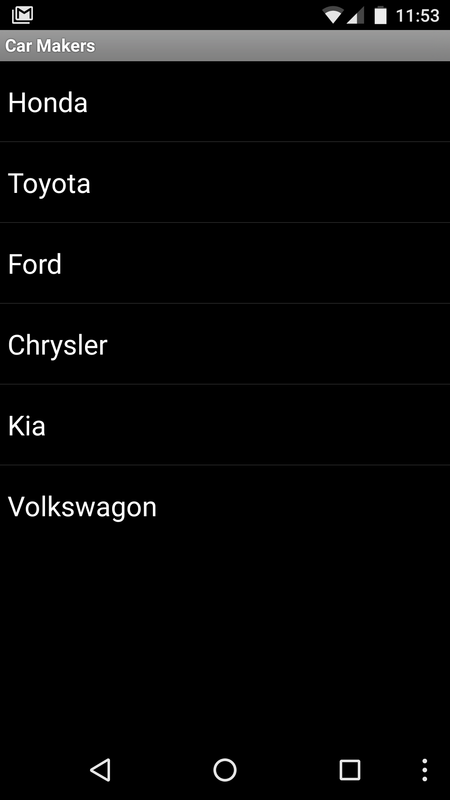 Our sample app displays the ListPicker button (the ListPicker looks like and acts like a button – when touched, the button launches the ListPicker selection list on a new screen). 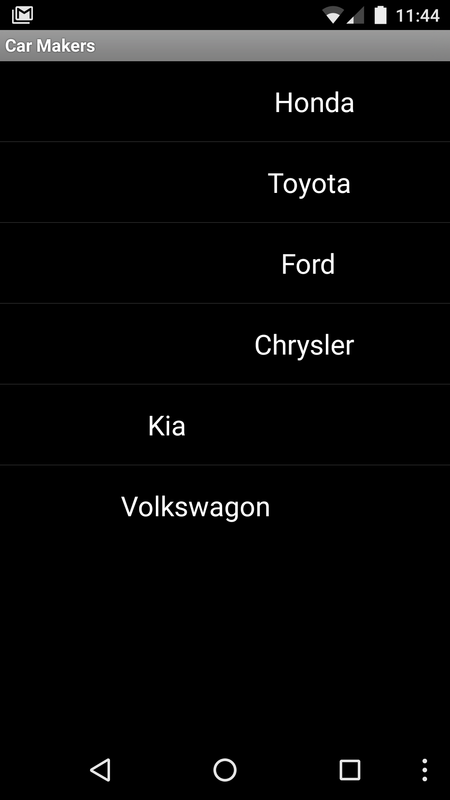 After selection, our app displays the item selected in the list in the are shown in the Designer View as “Your selection” – this is a Label component (whose name is set to lblSelected). For centering and right alignment to work, we need to know the width of the screen that will be used by the ListPicker. Unfortunately, there is no way to know the ListPicker width but we can approximate the width by setting the width of the ListPicker button to fill the entire screen, horizontally, and then reference the width of the button itself. 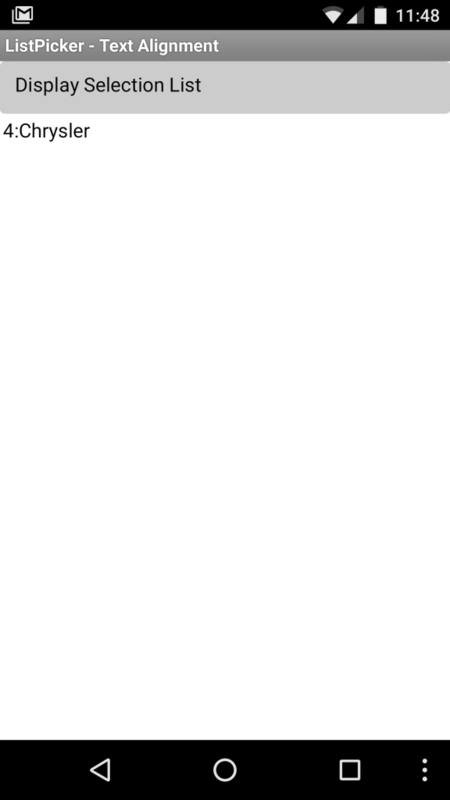 Of course, this requires that the ListPicker button be used as a full width button. The trick to right justifying or centering the text requires us to estimate the width of the ListPicker selection list, and then to add spaces in front of each text item appearing in the list. To do this, we reference the property ListPicker1.Width and divide it by an estimated number of pixels per character (I used 8) to estimate the width in terms of text characters. This value is stored in the global variable ListPickerWidth. ListPicker1.Width is the width of the button itself and NOT the width of the full screen ListPicker selection list – this is why we needed to set the ListPicker’s Width property to “fill screen”. We add items into the selection list, aligning each item to the right – or to the center – by calling a couple of procedures – AlignRight and AlignCenter (see below). lblSelected refers to the Label component that will display the selected item. We initialize it to display the calculated ListPickerWidth. 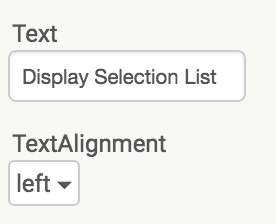 To align the text to the right, we need to add spaces in front of the selection item. 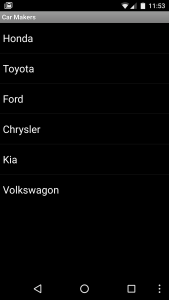 If our selection item is “Honda”, then to make it appear on the right side of the ListPicker, we insert spaces in front so that “Honda” becomes ” Honda”. There are several ways we can put spaces on the front of the text string. In the method here, we use the segment text block to extract a string of spaces from a long set of blank space characters. Note that the X variable is a parameter variable. When our code calls AlignRight, the value “Honda” was passed through to the procedure where it is stored in the variable X.
Centering is handled in a similar fashion – except we add only half as many spaces: Make sure the string containing the blank spaces, above is long enough! 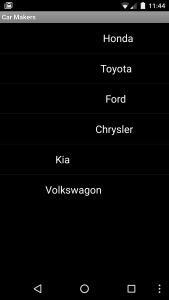 If we selected “Chrysler”, then the index position of 4 and the text “Chrysler” are displayed on the screen. 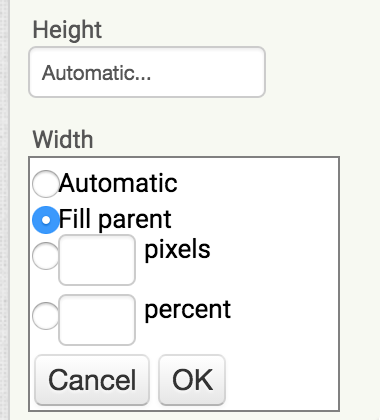 Making this work required us to use a “work around” of setting the button width to the maximum width of the screen, and then use the button width to estimate the width of the ListPicker selection list. This value is not precise and results in the alignment being slightly off. It may be necessary to add a small constant to the estimated text width – but whether that would work on all devices would require additional testing. No source code link as there is very little source code in this example! Just enter the blocks you need for your own apps! Hwanseob Lim liked this on Facebook. Pawan Kevin liked this on Facebook.